I have a lot of respect for those who serve our country and I think it’s great that there are special tax benefits offered only to those who serve. The idea of income can be complicated given the different types of pay a service member receives. First, you have your pay, then living allowances and moving allowances, travel allowances and then combat pay. Some are subject to tax and others are excluded, all must be reported. 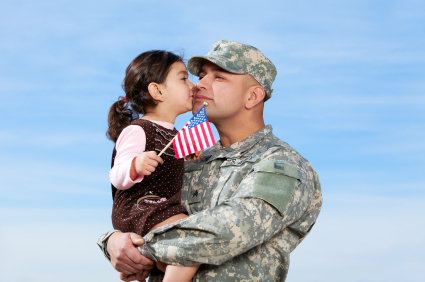 It’s a good thing you can use TurboTax Military Edition for your last minute tax filing so you can easily be guided through these special tax benefits and can keep more of your hard-earned money. Here are 5 last minute tax tips for military that will help you save when you go online and file your taxes. If you are deployed in a designated combat zone, which are designated by an Executive Order from the President and listed here on the IRS website, then part of your pay is excluded from taxation. Afghanistan has been a combat zone since September 19, 2001. In practice, the income that is excluded as a part of this will not appear as wages on your W-2. If you look at your W-2 and it doesn’t match what you’re paid, it’s because of the exclusion. If you do have excluded pay on your W-2 and it shouldn’t be, then you need to get a corrected form from your finance office. This is not a military-only tip but given how often service members move, it’s one that you may be able to take advantage of. If you’ve lived in a home for two out of the last five years, you are allowed to exclude up to $250,000 of gain ($500,000 if you are married) on the sale of that home from your taxes. These are the same rules as for civilians but you can have the 5 year test suspended if you serve on qualified official extended duty. If you are a reservist and travel more than 100 miles away from home to perform your duties, you can deduct unreimbursed travel expenses as a miscellaneous itemized deduction. This can include all unreimbursed expenses from the time you leave home until you return, it’s limited to the amount the federal government generally reimburses employees for travel expenses. This is a bit of a sad tip, but if a member of the U.S. Armed Forces dies in active service in a combat zone or from wounds, disease or other injury received while in a combat zone or from a terrorist or military action, the tax for the year of death and potentially for prior years can be forgiven. This last tip may be useful come tax payment time but if you are performing military service and you notify the IRS that your ability to pay the income tax has been “materially affected by your military service” then you can defer payment to 180 days after your termination or release from service. If you pay the tax in full before the 180 days, you will not be charged interest or penalty. It’s great that the IRS made allowances for those who serve, especially in combat zones far away from home. I know that being away from your family and loved ones is hard enough, you don’t need it to be harder. With these last minute tax tips, the ease of use of TurboTax Military Edition, and the ability to ask TurboTax tax experts your tax question while you file your taxes, free, there’s no reason to delay filing your taxes any longer. The faster you file, the sooner you will get more money back in your pocket. Military members who are ranked E-5 and below can file free.